Cool and refreshing are the words that come to mind with this delightful and easy Cucumber and Watermelon Salad. This is the perfect dish for the weather we are having in Massachusetts right now. Just last week I was wondering where summer was. It was literally 65 degrees outside in June. And that wasn't a fluke of a day. Then, on Friday we hit the mid seventies. And then the oppressing weather arrived. We are officially in a heat wave and schools are releasing early because it's just too hot. So cool and refreshing food is what we all need! Oh, and there is not a smidgen of fat in this salad. Hurray! I think I will nosh on it at work tomorrow instead of eating chocolate or other bad things I shouldn't be eating. That would be good. Last year this was my summer party go-to dish. The bowl usually ends up empty and I leave with a deep sense of pride. I like pride. This recipe came from Everyday Food Magazine, which a few months ago I decided to let go of (here's a link to my thoughts at the time). But bringing this recipe out today made me think twice about that decision. Perhaps I will renew after all! 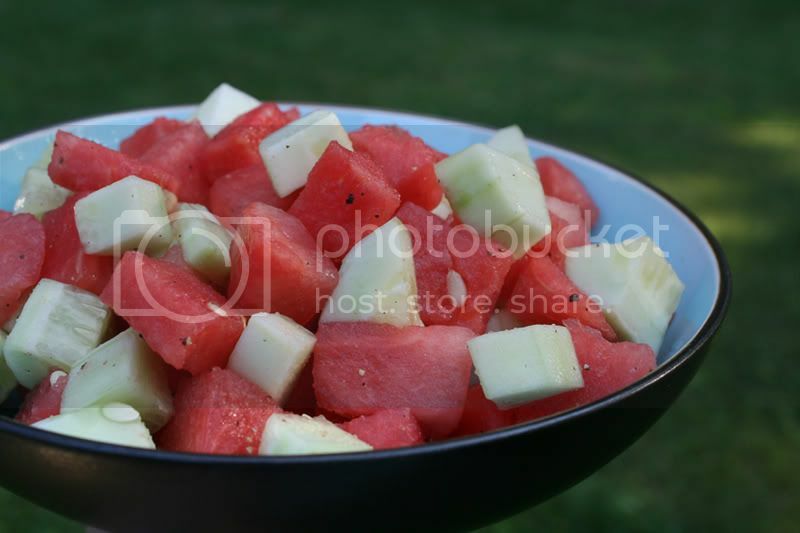 In a large bowl, toss cucumber and watermelon with lime juice, and pepper. Serve immediately or chill and eat later. Hi! Nice Blog and recipes! I just made this refreshing salad! A combination I would have never thought of!